Constructed of 1″ welded tube steel, these enclosures fit perfectly ontop of our metal stand and will greatly reduce your construction time. Cement board can be easily applied to the exterior using self tapping screws. Finishing with stones or tiles is easy to install at this point. Oven enclosure for Milano Ovens. We are pleased to announce that we are once again making the oven building process even easier. 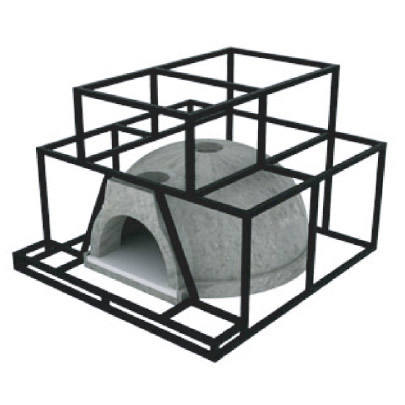 Constructed of 1″ welded tube steel, these oven enclosures fit perfectly on top of our metal stand and will greatly reduce your construction time. Cement board can be easily applied to the exterior using self tapping screws. Finishing with stones or tiles is easy to install at this point.